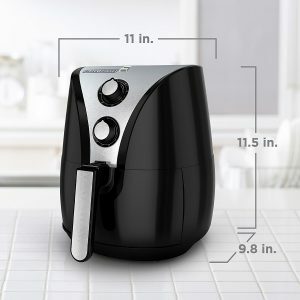 Black and Decker Air Fryer Review is going to be all about the major pros and cons of this Air Fryer and if it is really as good as the Philips Air Fryer. To be honest, the Black and Decker Air Fryer is indeed a really good quality air fryer and if you are looking for an Airfryer with a 2L capacity at an affordable price point then keep on reading the review and this Air Fryer might be the one you need. 1. AirFryers usually works on the principle of using convention fans that circulates hot air in the basket which holds the food items. The principle of an air fryer is similar to that of a convection oven, although, it reaches high temperatures very soon and gives more of a fried taste rather than baking which is usually the case with ovens. 2. The Black Decker AirFryer is easy to use and has a capacity of 2 Liters which means that you can cook for 1-2 people at a time. If you want to cook for more then you might want to do that in batches as the AirFryer comes with a limited capacity and stuffing food would not be a good idea as it would come out unevenly cooked. 5. The temperature can vary from 175-400 degrees and you can easily fry, saute or bake food inside this air fryer. The Airfryer can be used for making french fries, chicken wings, cakes or even pies. Although the limited size of the Airfryer is going to make smaller versions of cakes and pies it definitely does the job and if you are a student who wants to cook all these on a budget then you can surely try doing that with this AirFryer. 6. The timer on the AirFryer can vary from 0-60 minutes and once the timer goes off, the Airfryer automatically stops cooking. The handle which is used to pull out the separator is insulated pretty well, hence you can pull out food items immediately after they have been cooked inside the Airfryer. 7. As per the claims, the Air Fryer does get hot inside really fast which implies that you barely need to preheat it before cooking anything. There are vents in the AirFryer that help maintain balance in temperature and make sure that it does not get way too hot. 2. You can hear a fan noise while the AirFryer is in use. So, if you are having guests over, it can be a little evident that you are using the AirFryer. However, you can drown down the noise by switching on the TV, if that helps. 1. Cooking French fries in this Airfryer was pretty easy, you need to set the temperature to 400 degrees as suggested in teh manual that comes with teh Airfryer and set the timer for 20 minutes. 2. Shake the fries after 10 minutes in order to have an even cooking. 3. Take the basket off once the 20 minutes are done and your French Fries are ready. It is pretty interesting to see that just with 1 tbsp of oil, you get pretty much crisp and delicious fries. The fries do not dry out due to the lack of oil and that in itself makes this AirFryer a winner. It gives the fries a pretty much similar taste to that of deep fried french fries. The Black and Decker AirFryer is definitely worth the buy and if you want a nice affordable Air Fryer that would give you a great frying experience. This Air Fryer is pretty much the best that you can get within a $100 price range and on Amazon, this Air Fryer is most of the time available at a discount. If you found the post helpful then do share it with your family and friends on Social Media.